When Riane learned she was dying, she went to Sesqua Valley. She found a thin tree in the fat shadow of the twin mountains that perched above like great petrified wings. She ran her fingers over the lower branches, feeling for whispers. She made her choice and, in exchange for a small red libation from a slice in her palm, cut free a branch. The following day she returned to her home in Innsmouth, Massachusetts. It was a steep old house, the color of a rain-fed Atlantic, seated on a hill above a meadow. The bottom floor contained a potter’s shop, containing dusky paintings and strange creatures fashioned from painful twists of driftwood. The branch waited downstairs until the moon came up from the sea, abandoned in the sky like a shell on a beach. Riane tied back her long, light hair, burned incense, removed her clothing, and then walked down the slow stairs. The branch leaned in a corner, pulsing with Sesqua darkness. 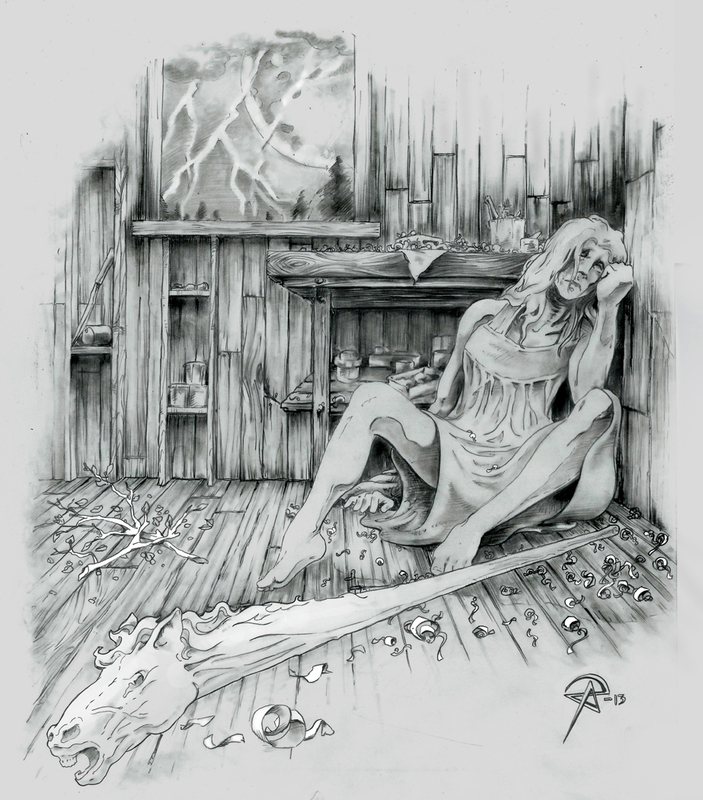 With candles lit and tools readied, Riane sat upon a stool with the branch across her legs and set to work. The dying woman shaped the branch into a staff – white, smooth, bearing at its top the head of a horse. The moon spun above the house, dimmed, descended westward as dawn made pink insinuations and, impatient, forced light onto the old sea-colored house. Trembling and chill in the darkness, Riane collapsed, exhausted, to the shaving-strewn floor. Later that morning, Lauren came to the house and found her sister; she helped her up to bed. Riane was too weak to go downstairs; her potter’s wheel stood silent, her tubes of paint faded under dust, her carving tools never again to know the warmth of her hands. The nights belonged to fever. Riane tossed in her sweat, told strange stories in her sleep, and made a curious alphabet of gestures with hypnagogic fingers. Lauren sat by the bed throughout, watching as death’s slow-sculpting hands shaped her sister into something fearful and sad. One night, Riane freed herself from the bed. It had been a month since the moon rose dripping from the Atlantic. She moved past her sister who was slumped, sleeping, in a chair, leaving her to guard an empty bed. Riane moved quietly to the first floor where the staff awaited. She walked out into the soft light. She walked down the hill into the meadow behind the house. The wind shared a secret of wild herbs and brine. She tapped the earth with the staff as if to wake a heart beneath the field. The staff thundered in the ant mazes below and echoed in the air where clouds wrapped the moon. Lightning thorned the sky. A bolt found the staff, knocking it to the ground, burning it into the meadow. Lauren had seen the strange horse-shaped pattern of ashen white in the middle of the field, had witnessed lightning dance in the field alongside the pale horses that thundered about in the rain. How strange that they always vanished when the storms faded. How strange that the crows that pecked the horse-shaped mark turned white and hovered above it like gulls. The night smelled like rain. Riane sat up in bed and stared at her sister. She told Lauren to go to the meadow and to bring some of the dust from the place where lightning had struck. Lauren assumed that the fevers were back, but her sister insisted, so she went. Thunder mumbled in the distance, and something snorted in the close darkness when Lauren bent to dig at the chalk-white horse. She hurried back into the steep house and up the stairs to her sister’s room. Riane smiled sweetly and whispered goodbye. She took the ash, touched it to her tears, and died. Lauren held her hand until it went cold. Thunder stampeded across the meadow, and wind flung the doors wide. Rainy white horses danced into the room, gathered about the bed and, grasping the shoulders of Riane’s nightgown in square teeth, carried her limp body down the stairs, down the hill, and into the field. Lauren watched from the window as they dragged her limp and flopping sister about the wild grass, lightning spitting, rain hissing. White crows swirled above, calling, and Riane’s legs stirred, flexed under her soggy garment. The horses ran, skimming her feet over the damp earth until her feet stepped of their own accord, and she was upright, moving. The horses released her and she ran, laughing in the grey brine of the air, her mane behind her in the galloping storm. 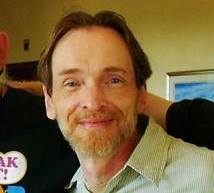 If you enjoyed this story, let Scott know know by commenting — and please use the Facebook, Twitter, and Google Plus buttons below to spread the word. Story illustrations by Dave Felton & Anthony Pearce. Your beautiful prose and rich imagination are extremely suited for ye conjuring of the Valley. I love this story so much. And the illustrations are superb. Wonderful, my friends. Like so many of your stories, it has the feel of an “actual” folk tale. It was like reading an untold fairy or folk tale. Untold until now. It was a great read. Thank you, folks, for the lovely comments! And, Wilum, it was an honor to write a Sesqua tale, and I’m delighted to be in your special issue! A beautiful, rich tale. Reads like an old, old folktale. A wonderful, dreamy, story. The descriptions are intense but with a softness like a half remembered dream. I look forward to reading more of your work. What a chilling, moving and beautiful story. Thanks for reading, folks, and for your lovely comments! 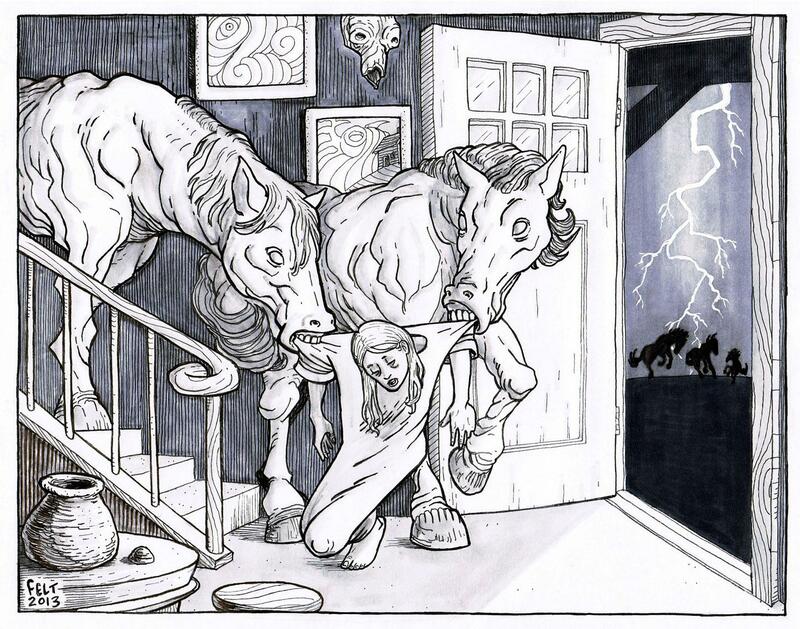 As a lover of horror, horses and thunderstorms, this is a hauntingly beautiful tale. Well done. I found it a wonderful story. Would that I should go as well.